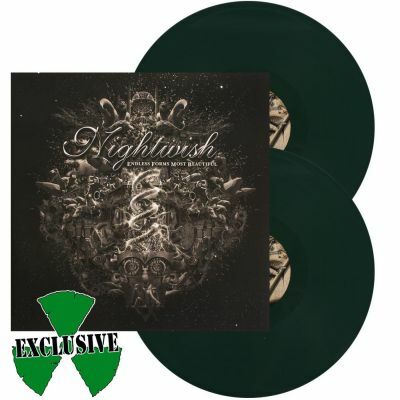 NIGHTWISH - ENDLESS FORMS MOST BEAUTIFUL GREEN VINYL (2LP) | Online Shop | Wizard LTD. Album: "ENDLESS FORMS MOST BEAUTIFUL GREEN VINYL (2LP)"
A new era begins ... NIGHTWISH has always stood for virtuoso perfection. They are able to evoke fantastic dream worlds, fade out time and space, and touch you deep inside with their majestic symphonic compositions. Vision and temptation, love and passion, devotion and blood – this Finnish band also has the courage to aspire to new creative and innovative ventures. Since their formation in August 1996, they have risen long ago to become the biggest Symphonic Metal band. It is no secret that main composer and keyboard player Tuomas Holopainen is a versatile songwriter, who lives for his music, dedicates himself to his art and this seeps through in every single note of his work.